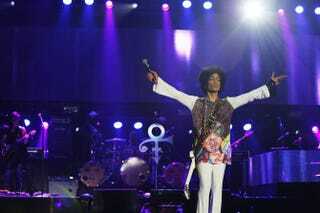 The crowd wanted a party and His Purpleness delivered. With a nostalgic salute to the 1980s, the Afro-shaking, guitar-riffing Prince showed up in New Orleans and showed out for the 20th anniversary of the Essence Music Festival. He tore up the Mercedes-Benz Superdome with hit after hit, and the capacity crowd of 50,000 sang along to Little Red Corvette, 1999, Kiss and When Doves Cry. The finale was his megahit and signature song, Purple Rain.